Pen and ink drawing of the Town Hall in Bombay by an unknown artist c.1825. Bombay, the capital of Maharashtra, is one of India's major industrial centres. The Town Hall is situated on the east side of Elphinstone Circle, formally Bombay Green, in the fort area of Bombay. The Town Hall was designed in the Neo-Classical style by Colonel Cowper of the Bombay Engineers and the construction started before he died in 1825. 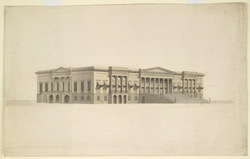 This drawing may be one of the preparatory works for the final design of the building. The Town Hall was finally completed in 1833 with the assistance of Charles Waddington.